Sweet Emily such a cute girl with a contagious smile. You got to love her dimples! I was 18 years old when she we born. I love that just this past year she was so surprised when I told her I was 39 years old. She said that in her mind I was only 29. Keep thinking that way Emily, keep thinking that way! Emily is the 4th child of my oldest brother Matt. She is now 21, going to college and she seems to have her head attached just right. She is quite the performer, her and her sisters all did dance and after high school Emily continued dancing with a group called Kalamity while she attended college at Dixie State College. Here is a spot where they blogged about her. I have been told by some people from my home town that Emily reminds them a lot of me. I am not quite sure if that is a compliment. But I think the traits we have in common is our ability to be independent, can be bossy and in charge, and don't really take attitude from others. But Emily has many more good traits than me too and the one I love the most is her ability to love. I love the way she love my parents, her Grandparents. She is lucky to have been able to grow up in the same town with them. She is so cute to them, she calls them or visits them just for the heck of it and I think that is great. I think it is awesome that she has a close relationship with them which is something I never had with my Grandparents. 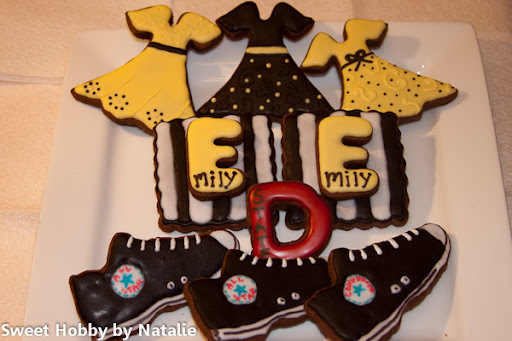 So when I thought of a theme for Emily I thought of Dance...... ballet shoes, tutus, NO. The group, Kalamity, that Emily was a part of did hip hop and their dance shoes were Converse. 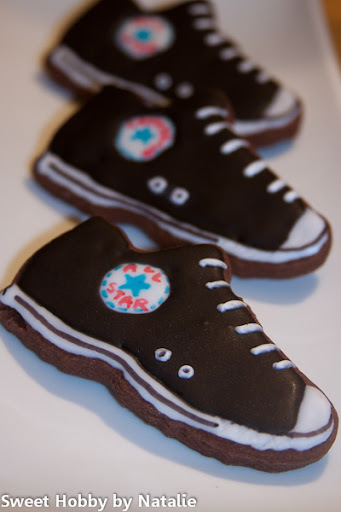 I tried my best to recreate a Converse shoe but soon realized that if I need to do a lot of details I need to have a bigger cookie. Oh well at least I tried. 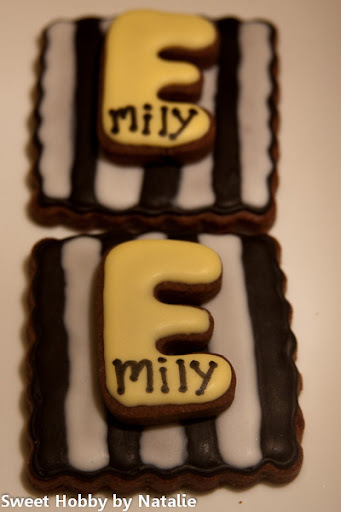 Did the double decker cookie for the letter again. 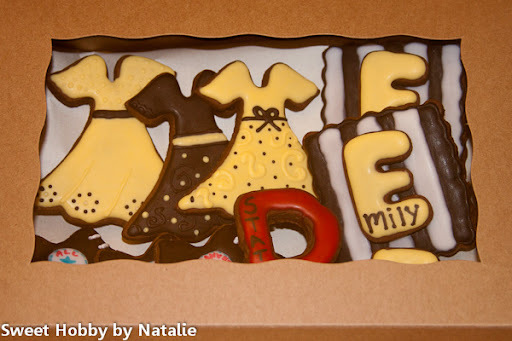 I made some of these cookies a year ago and they were one of my favorites. 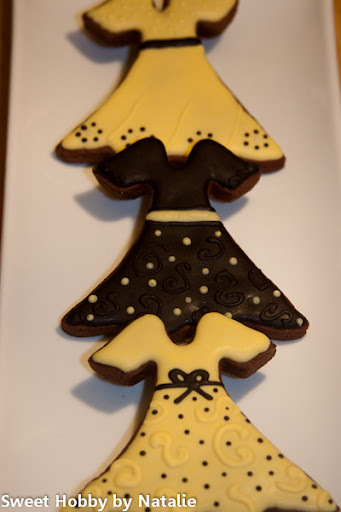 I think the dresses are so cute. For some reason the icing kept forming divots in it. I have no idea why. I use both royal icing or glaze but lately have just been using the glaze. I am no expert so not sure why the divots. Yellow is Emily's favorite color and she loves the color theme of yellow, white, gray. I chose to do black since I already had black mixed up. Emily now is going to BYU and she was attending a friends wedding yesterday so she stopped by on her way home. She did it so we would not have to make a special trip down to her and she also took her cousins Terence's cookies to him since they live in the same city. See she is so sweet! Thanks Emily and Happy Birthday to you!! Oh and the red "D" is for Dixie State College. She just finished there in December and still is a little homesick for the warmth of St. George! Thanks that is so nice. Just cut out Nathans and will decorate them tomorrow to send with Emily on Thursday. I am kind of excited for them. I hope they turn out cute.